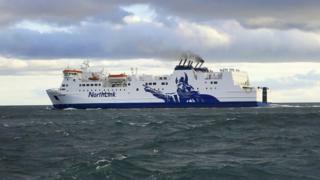 A firm has claimed the proposed next £370m Northern Isles ferry contract poses an "existential threat" to its market position. Three companies tendering for the contract - CalMac Ferries, Förde Reederei Seetouristik GmbH and Serco NorthLink - were revealed by the Scottish government last month. The contract will run for eight years. Scottish Ministers are offering to subsidise the business which wins a tendering process to provide the services. Judge Lord Boyd was told the Scottish government was acting unlawfully in its plans to attract companies to operate sailings between Aberdeen and Orkney and Shetland. Pentland Ferries, which currently operates a service between Caithness and Orkney, believes the subsidy is unlawful. It believes the proposal breaches European competition rules and if successful would force it to stop trading. Pentland's advocate Mark Lindsay QC told the judicial review: "This is viewed as an existential threat by the petitioner who is concerned that they will no longer be able to trade. "The subsidy is unlawful state aid and it will disturb the market." Minister for the Islands, Paul Wheelhouse, previously said the contact had flexibility built in, to allow the services to meet demand across important sectors to the islands' economies, including tourism, fishing, food and drink, aquaculture and farming. In 2012, ministers awarded a six-year contract to Serco.